Recently, Ram Madhav, a senior leader of Rashtriya Swayamsevak Sangh (RSS) confirmed to the media, their involvement in the recent Parliamentary Elections to make Narendra Modi the Prime Minister. Generally, RSS does not compete in the elections and does not share power. Ram Madhav further confirmed that this was the second time that RSS had totally involved their cadre in the election strategies. Even Prime Minister Narendra Modi confirmed the active involvement of RSS in his victory. When Indira Gandhi imposed emergency in 1975, RSS was banned and more than 10,000 RSS workers were arrested. During the 1977 General Elections, RSS worked at the ground level to defeat Indira Gandhi. During that time, the Janata Party won 345 seats out of 543 seats and formed the Government. Though RSS is an apolitical organisation, they involved their cadre to restore democracy in 1977, Ram Madhav said. After 26 years, RSS recently involved their cadre again to bring a change of Government, when the nation was facing large scale corruption, policy paralysis and lack of leadership. Congress made public statements that the electoral fight was between Congress and RSS. Interestingly, NDA won 336 seats in the Lok Sabha. RSS is known to work from behind and not publicising their achievements, however significant they might be. 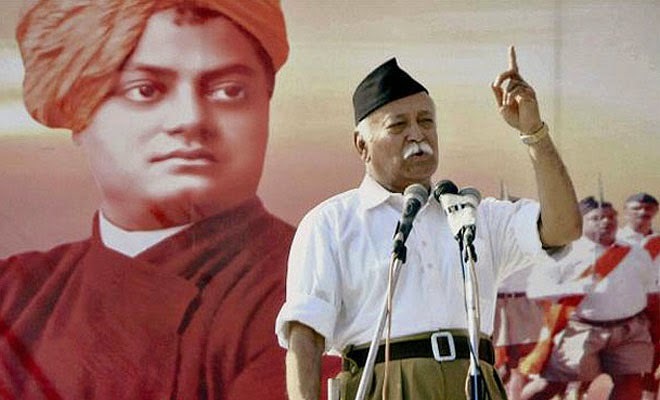 RSS was founded by Dr. Keshav Baliram Hedgewar in 1925 with the intention of promoting the concept of a united India and to promote indigenous ideology. They drew inspiration from social and spiritual leaders like Swami Vivekananda, Vinayak Damodar Savarkar and Aurobindo. Their cadre was also active during the freedom movement. RSS conducts a daily one-hour ‘Shakha’ (training) of yoga, physical exercise and games for their members to develop their spirit of nationalism and patriotism. It is reported that around 5,500 full-time workers (pracharaks) manage the RSS. Atal Bihari Vajpayee, L K Advani and Narendra Modi started their public service as pracharaks. It is also estimated that around 50,000 shakhas are held every day throughout India, with the participation of nearly 800,000 to 1,000,000 volunteer members, belonging to various castes and professions, without any discrimination of status. The RSS network has more than 30 sister organisations, viz. Sangh Parivar, which includes the political wing BJP, India’s largest trade union Bharatiya Mazdoor Sangh (11 million membership), India’s largest student union, Akhil Bharatiya Vidyarthi Parishad (ABVP with 2,200,000 members), Vidya Bharathi (running 13,500 schools with 3 million students), Bharatiya Kisan Sangh (2 million members), Muslim Rashtriya Manch (1 million members), Vanavasi Kalyan Ashram and many others. RSS spreads the message of patriotism and nationalism in all the districts of the country through these organisations. The current chief of RSS (Sarsanghchalak) Dr. Mohanji Bhagwat is the 7th chief after the launch of RSS and he is the mentor for all the Sangh Parivar organisations. The RSS cadre is known for its rescue operations during disaster situations like the Bhuj earthquake in 2001, Tsunami in 2004 and the Uttarkhand disaster in 2013. In 1962, the then Prime Minister, Pandit Jawaharlal Nehru had requested RSS to assist the Government in various assignments during the Sino-Indian War. 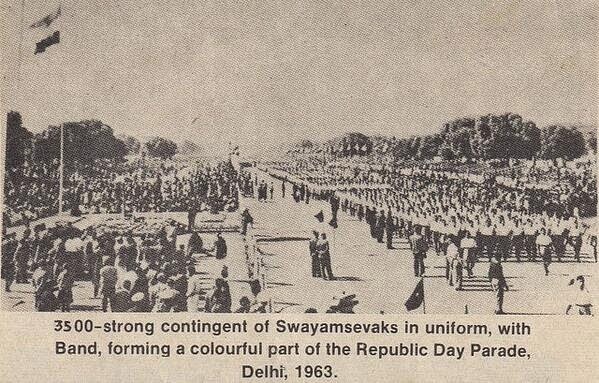 As a gesture of goodwill, in 1963, Pandit Nehru invited RSS to participate in the Republic Day parade at New Delhi. Again in 1965, during the Indo-Pak war, RSS was requested by the then Prime Minister, Lal Bahadur Shastri to take care of the law and order and the traffic in Delhi, so that the policemen could be spared for war duties. Even during the 1971 Indo-Pak war, RSS cadre helped the authorities to maintain law and order in various states. When Gandhiji visited a 1500-strong RSS camp at Wardha in 1934, he was pleasantly surprised to find that the Swayamsevaks were not even aware of the castes of one another, not to speak of any ideas of untouchability. The visit left such a deep impression on Gandhiji’s that he referred to it thirteen years later. The RSS, with its paramilitary style of functioning and its emphasis on discipline and nationalism, is sometimes seen by some as "an Indian version of fascism". When Mahatma Gandhi was assassinated in 1948 by Nathuram Godse, an ex-member of RSS, the Nehru Government banned RSS for the first time in February 1948. Justice Kapur Commission was set up to enquire into the murder of Mahatma Gandhi. Justice Kapur observed that RSS was not responsible for the murder of Mahatma Gandhi. The Government lifted the ban in July 1949 with the condition that RSS should adopt a constitution. RSS was again banned in 1975 during Emergency and the ban was lifted in 1977. RSS, as a matter of policy, does not display any reaction to bouquets or brickbats. Thus, even misleading and wrong information about RSS go undefended. This leads to confused perceptions about it. Even for writing this article, I had to struggle to get information as they do not have any professional Public Relations set-up, to share their positive achievements and services to the nation. Great article. It induces me to join RSS and follow "Indianism"